Able Moving and Storage has the skills, experience, and resources to manage all your corporate relocation needs in Prince William County. We excel as a corporate relocation company by providing the most efficient and dependable Prince William County corporate relocation services available throughout the US and worldwide. We have worked with a wide range of clients throughout Prince William County and the surrounding area, coordinating relocation services that cater to their particular company policies, budgets and timelines, while at the same time providing a smooth, problem and stress-free relocation for your company assets and employees. 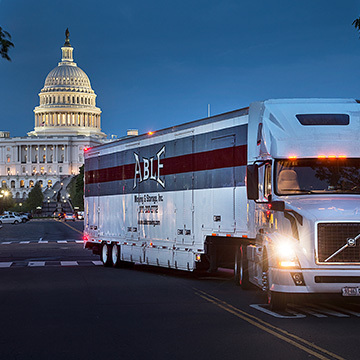 As a large, independent moving and storage company, Able Moving & Storage, Inc. performs “pack, load & haul” relocation services, with dedicated crews for specific accounts, from point-to-point throughout Prince William County and beyond. As a moving and storage company that has been in operation for over a quarter of a century, we are able to call on immense expertise and resources in the coordination of both long distance and local moves of all sizes. You can rest easy, knowing that Able Moving & Storage will make your employee’s relocation process in Prince William County comfortable, efficient and easy.